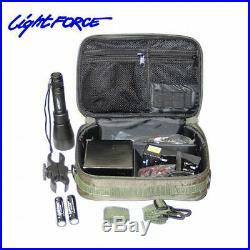 Lightforce PRED6X Scope Mounted Gun Light Kit. The PRED6X is the second LED firearm mounted light from Lightforce. 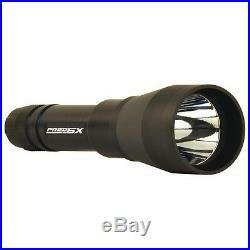 Designed in Australia, this spotlight out-performs most if not all the hunting lights in its price bracket. This mighty little gunlight comes packed with features. Weighing just 248gm and measuring 185mm in length, the PRED6X is a lightweight yet strong firearm mounted gunlight perfect for medium range hunting. Machined from NASA grade aluminium and finished with a hard anodised coating the 6x has a sleek look, yet remains tough and practical. A rubberised flip up filter enables you to change the light to suit your hunting needs. The filter comes with a red lens, which is the perfect tool when hunting light shy animals. Due to its flip up design the pred 6x allows you to instantly switch between white and red light in an instant. A stock mounted tail switch makes it easy to operate the light in any conditions. The tail switch screws directly onto the light giving on / off control at your fingertips. Silent operation means you wont spook game when turning the light on and off. The high output LED light source gives clear species definition out to 150 yards. By using this light, animals can be clearly seen when camouflaged in thick cover even a straw coloured fox skulking through dry grass can be made out with the PRED6X. 1 x Li-Ion battery (type 18650 2200mAh) gives the PRED6X 90 minutes of runtime at full intensity. Included batteries are rechargeable and the kit comes with an in car or mains smart charger to charge on the run. The charger can charge two batteries simultaneously. A universal non-scratch mounting clamp to suit from 1 to 40mm scope tubes. Delivered in a rugged carry case. All Pred6x lights are supplied with: 1x battery charger with connections for both cigarette plugs and 240V mains power, 1x flip up red filter, 1x premium padded carry case, 1x stock mountable tail switch, 2x rechargeable batteries, 1x lightweight universal scope mount. You must return your item(s) in the same condition as it was received, not used or altered in any way. You must also include, in the same condition as it was received. All original packaging such as boxes, bags, tags, and labels. Accessories such as cords, remote controls, pouches etc. "Free Gifts" or bonus items. All items included in the package. This is important and ensures you are happy with our terms. We want your shopping experience to be a happy one and wish to avoid any complications later on. Please return the goods to. Reid Marine & Outdoors Ltd.
Unit 23 Northfields Industrial Estate. The costs for returning the goods are paid by the consumer. We will not accept any responsibility for items lost or damaged during return transit. We may ask to see a photo before any decision is made. The item "Lightforce PRED6X Scope Mounted Gun Light Kit (Hunting)" is in sale since Thursday, October 20, 2016. 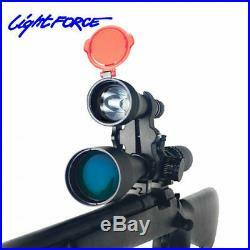 This item is in the category "Sporting Goods\Hunting\Accessories". The seller is "charlestoko" and is located in Brixham. This item can be shipped to United Kingdom.